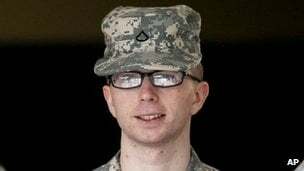 Manning was sentenced to 35 years in prison and has since changed his name to Chelsea. The San Francisco gay pride organization banned the National Guard booth at the Civic Center Plaza this year. But, traitor Bradley (Chelsea) Manning is being celebrated as honorary grand marshal. Organizers of San Francisco’s pride weekend festivities have yanked the welcome mat away from the National Guard, voting to ban the Guard from setting up a booth at the festival. The decision comes at the same time Pride organizers are allowing a controversial Army private who leaked military secrets to be honorary grand marshal. The board of the San Francisco LGBT Pride Celebration Committee rejected a request from the Guard to set up an informational booth at Civic Center Plaza during Pride Weekend. Last year, the National Guard had a booth at Pride Weekend for the first time – staffed by gay soldiers – following the repeal of the Don’t Ask, Don’t Tell policy. The Guard was also welcomed at Pride events in Los Angeles and San Diego. The military’s current ban on transgender service members serving openly, minority recruitment tactics, and sexual assault scandals were factors in the board’s decision, Pride Executive Director George Ridgely told LGBT news weekly Bay Area Reporter. Board President Gary Virginia said in a letter the board was willing to review its decision after this year’s event, Bay Area Weekly reported.